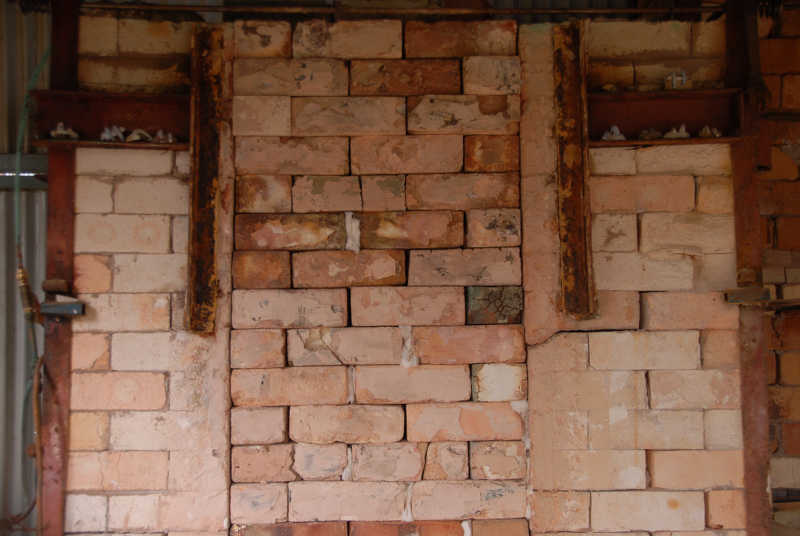 The salt kiln must be prepared for the firing, often involving repairs to the brick walls and arch and always extensive work preparing the refractory kiln shelves, shelf props, fire boxes, burners, door lagging clay, wadding clay and clay discs to sit the pots on. All the pots have to be elevated from the shelves otherwise the pots will be “glazed” to the shelves. Small wads or large pea sized balls of a clay / alumina mix are used. 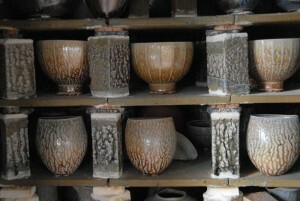 Bowls require a small disc of clay, made from this clay mixture. The bottom shelves are made from silicon carbide, these are very strong but not suitable for upper shelves as they foam up due to the sodium attack ruining the rims of the pots under these shelves. 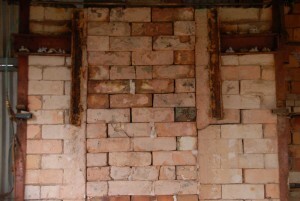 A high alumina shelf is used on the other shelves, these last about 6 firings only. 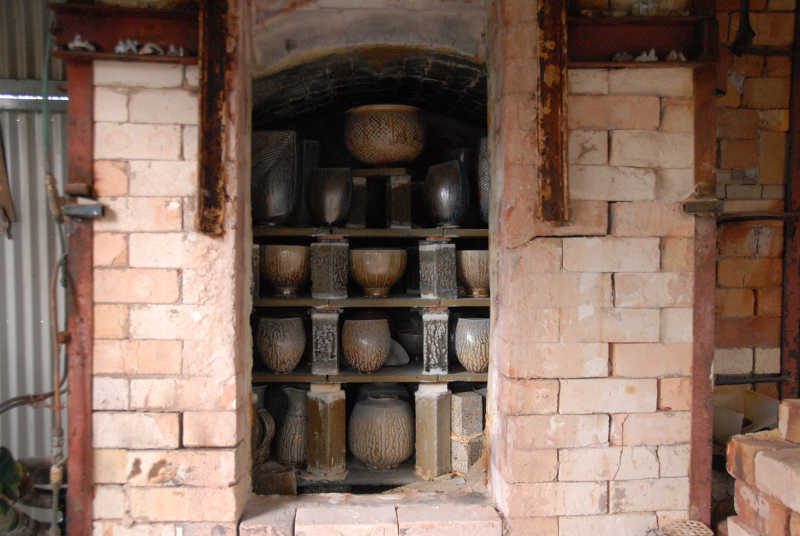 The pots are treated with oxides and coatings depending where they will be placed in the kiln, and the first pots are carefully chosen and coated as they will get more of the sodium vapour. These pots go in with consideration of flame path and size. Eight props are placed in so the next shelves just clear the top of the pots. 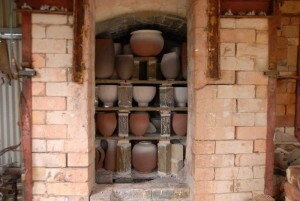 Subsequent props, pots and shelves go in to fill the kiln. Pyrometric cones are placed in a spot so they can be seen through a “spy hole”. These cones bend over when the temperature and time has been reached. It is then the salt is put into the kiln. The temperature is approximately 1300 / 1320 deg Centigrade [ a volcano is about 1250 ! ]. Over a period of an hour I put 14 scoops of salt into the fireboxes, 2 every 10 minutes. About 10 kgs of salt is used. The salt is a course grade agricultural stock salt. The salt must be damp, approximately 5-8% moisture content, the water is essential for the chemical reaction that takes place between the sodium in the salt and the silica in the porcelain to form a sodium-silicate-alumina glass … technically very similar to normal window glass ! On the video you can hear a “crack”, this the water instantly vaporising in the firebox that has a temperature around 1330/1350 deg C.
The kiln firing is started at 7.30pm, and through the night adjustments are made to the pre heating burner. 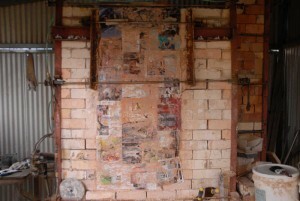 At 5am the kiln now 250deg, the main LPG burners are lit, and adjusted through the day. 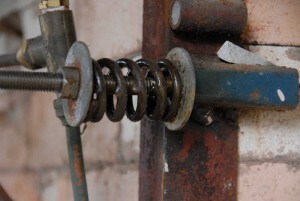 Salting is generally around 5pm. 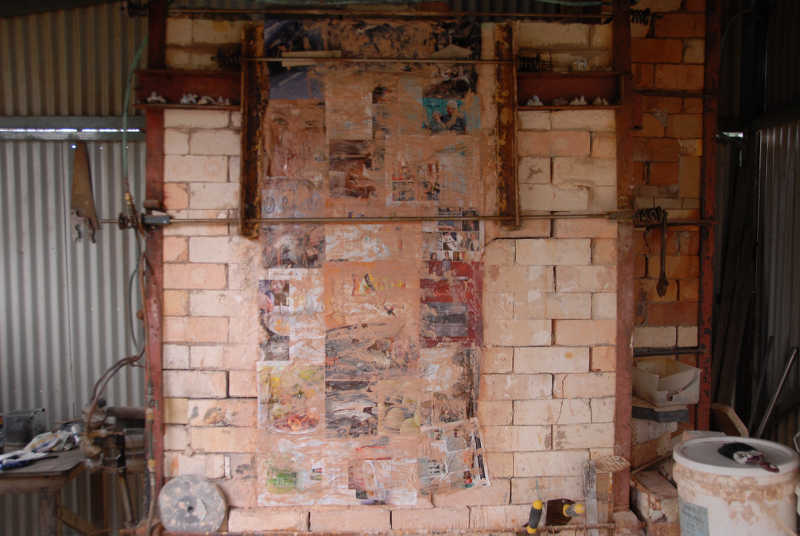 An hour and a quarter later the kiln turned off, the damper closed and the kiln left to cool for about 48hrs. 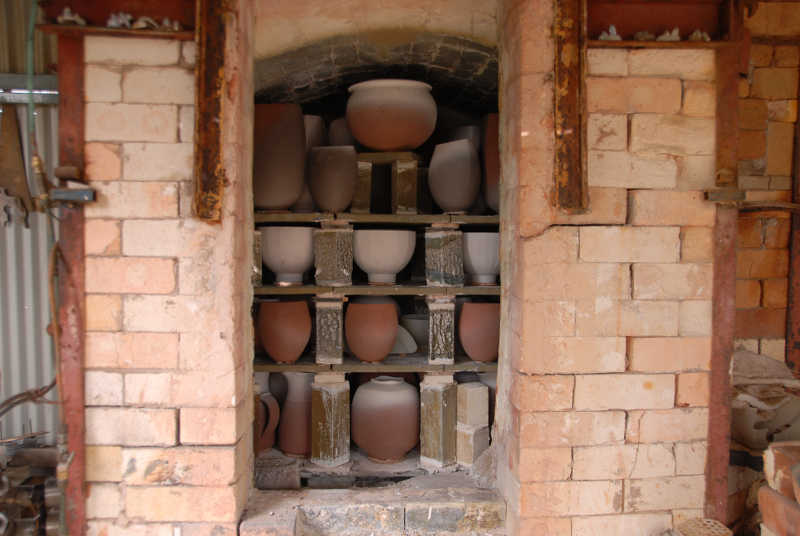 It takes a day or so to prepare the kiln, a day to prepare the pots, three quarters of a day to pack the kiln and after the kiln cools another day to unpack the pots, grind off the wads and polish the bases and foot rings so they don’t scratch the furniture! The success rate is less than 50%, sometimes way less!